The inside of Paolo Olbi's Store. Last month, my husband and I went on our honeymoon. We'd saved and planned and mapped out all our itinerary, but as we were traveling we were swept up in the magic of our destination: Italy. We toured Rome, climbed Vesuvius, scoured the museums in Florence, and took in the festivals and folk-art in Budapest (no, that's not in Italy, but it was all part of the plan). By the time we got to Venice, I was beat. I'd absorbed as much art as I had in my four years at art school in less than a week. I didn't really want to see anything else, even though the Biennale was being held that weekend. Joe dragged me along, promising that the show would be one we'd never forget. But when we finally made it to the main entrance we found out that the exhibits were closed to the public--press only. I was tired and just wanted to go back to our place and rest, but Joe pushed us along and we walked through the winding, narrow alleys of the canals in search of the master mask maker. As we climbed over a cobblestone bridge to another alleyway, my eye caught on a myriad of monochrome patterns. A shop window filled with letterpressed art faced the canal. Drawn to the tiny florals and bold type, I paused to look inside the small shop. Books. Tons and tons of books! Books lined the walls and the counters and the other window which faced the alley we were going to walk down. Pressing my face to the glass, I drooled. It wasn't a bookstore. It was a book-binding workshop. I could tell by the marbled papers hanging to the side of the counter, the care with which the letterpressed note cards were displayed and the book-binder's tools--a bone folder, extra-long rulers and a paper cutter--all arranged neatly on the front counter with a cutting mat. There was also a back-room where a small and very old letterpress peeked out. Signing his book! Such an honor! Paolo Olbi is a master craftsman. Opening his shop in 1962, he makes books and 'marmorata' paper by hand, using traditional methods that date back to the early 1900's. When we entered the shop, he was making tiny books with spines no bigger than a thumb's length and covering them with beautiful, swirled marble paper. I explored the albums, notebooks and sketchbooks filling the walls, touching each leather impression and breathing in their woody, oiled fragrance. No two books were alike, each stamped and bound with different materials. Some had gold leafing, while others displayed intricate carvings of interlocking vines and florals. When Paolo saw the drool on my chin, he called me to the counter. He asked if we were from California, and we both laughed. He mentioned that a few people from there and New York that had dropped in earlier. It must be the Biennale. 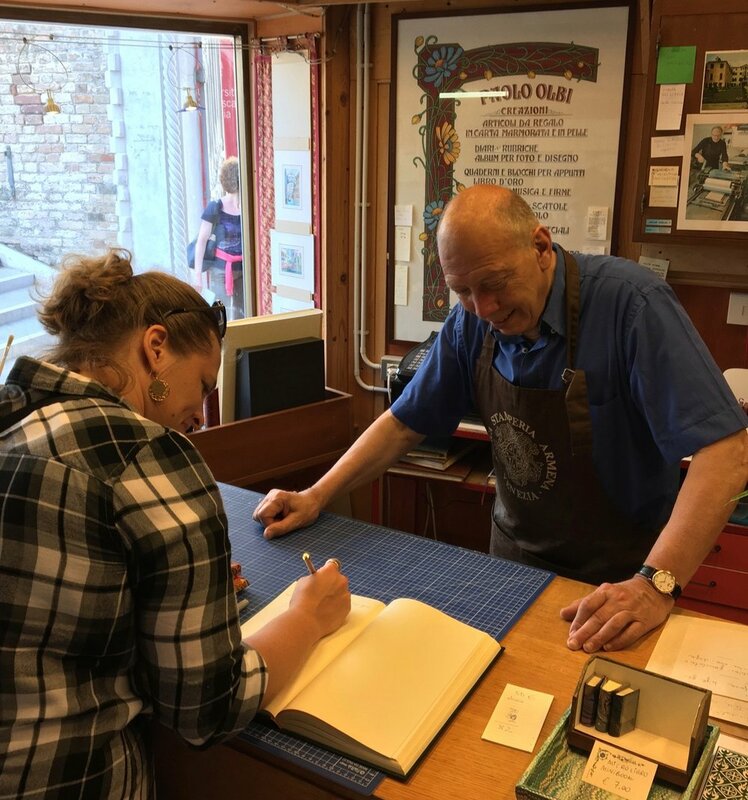 I stopped to watch him make his tiny books, and he talked about his craft, the workshops he teaches both at the University in Venezia and all over the globe. He honored me with a compliment on my own work and asked me to sign his guestbook where other artists and notables had left their mark. I also had the pleasure of getting his signature in my traveling sketchbook and a photo. Selfie with Joe in the Venice Canals!